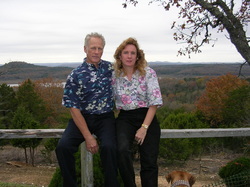 Diamond Acres is a family owned ranch, located in the heart of the Ozarks. We are dedicated to raising strong, hardy animals, including Anatolian Shepherds, Rhodesian Ridgebacks, large framed Kiko meat goats, Savannah cats and Jack Russell Terriers. We've also expanded to include Jack Russell Terriers, miniature donkeys to help "mow" the yard, and a herd of Miniature Texas Longhorns to full fill Jerry's life long dream of having longhorn cattle. Our Kiko goats and Longhorns live & thrive on 400 acres, and are guarded by our Anatolian Shepherds. We raise show quality pups that are born and raised in the pasture with the goats. The result is strong, healthy and good looking dogs bred from working livestock guard parents. Our Anatolians stay with the goats and cows where ever they roam on the 400 acres. This country is full of coyotes, fox, big cats & bear. We do not bring our goats in at night so our dogs keep the goats and kids safe day & night. In the past we raised quality Rhodesian Ridgebacks from Champion bred parents. We have only 2 elder retired dogs now. The ridgebacks have 3 acres around the house on which they hang out and relax in their remaining years. Another animal we raise on the ranch is Savannah cats. They are a cross between an African Serval cat and a domestic cat. They are a relatively new breed with the goal of creating a domestic cat that look like the African Serval. Along with the Savannah we have 3 pixie bob cats. They have extra toes and bobed tails. Our male has curled ears and occasionally will pass this on to one of his kittens. We use, Hanging Tree Herding dogs to help with our goats. We are super proud of our boy Eric who was the youngest Hanging Tree to ever be registered. They are incredibly loyal, gritty and smart. They are tough no nonsense dogs. The Jack Russell's run the yard and pasture to help with some of the mice that hang out on a ranch. And they are a little better for a "lap dog" than the Rhodesian's or Anatolian's. In 2013 we added a herd of Miniature Texas Longhorn cows. Jerry has had a dream to have Longhorns for many years and the mini's add a "little" fun. (Pun intended) They have long horns like their bigger family members but are much shorter in size. They only eat 1/3 to 1/4 of the the pasture and they are very gentle so they are great for even people with small acreage. We are located in the heart of the ozarks on the Missouri - Arkansas line overlooking Bull Shoals Lake. We are Just north of Harrison, Ar and 45 min SE of Branson, Mo.